A ‘forcing solution’, General Hydroponics Ripen is a late stage nutrient that can be used to speed up the final stages of fruiting and flowering. 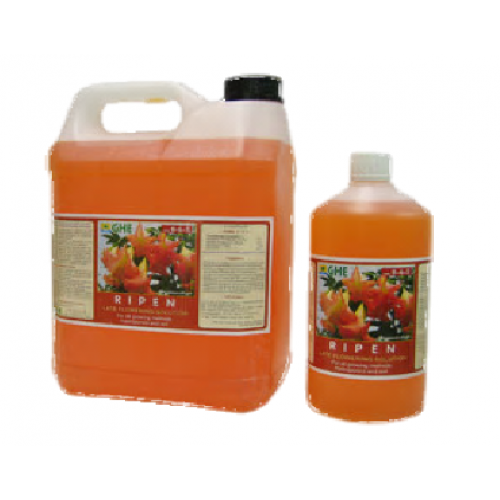 Ripen is particularly useful for outdoor plants where bad weather threatens to ruin a harvest, or for indoor plants suffering from a disease or pest problem to enable at least part of the crop to be salvaged. It will create a strong signal in the plant that it is coming to the end of its lifecycle and needs to fruit or flower, so you will often see the leaves turning yellow as the fruit and flowers grow rapidly. GH Ripen will ensure that any micronutrients or nitrates being stored in the plant are used, which will improve the taste of the crop. Please note that General Hydroponics Ripen is a complete nutrient and not just an additive, and should be used instead of your nutrient solution for the last week or two of flowering. It is suitable for use in hydro, coco or soil. Despite the low level of nutrients found in natural soil-based environments, plant growth neverthele..